Complaints against members are relatively rare. When they occur, it doesn’t necessarily indicate wrongdoing. However, sometimes, people don’t live up to professional standards. When that happens, the College must take action. How? Learn about the College’s complaint process. The College’s Investigation Committee reviews cases regarding the duty of student supervision. For example, in one instance, a teacher left a note on her classroom door advising students to find an available computer in the school to finish their work. The result? Several unsupervised students were found in hallways or the cafeteria. If you were a member of the College’s Investigation Committee, what would you do? See the outcome of Duty of Student Supervision. Myth: All complaints against members are referred to the Investigation Committee of the College. Fact: College staff investigates a matter ONLY if it relates to professional misconduct, incompetence or incapacity AND IS NOT frivolous, vexatious or an abuse of process. For example, a parent’s concerns about a teacher in handling his or her child’s Individual Education Plan are best addressed by the employer. 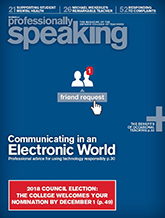 See and connect with candidates in the 2018 Council election. Discover where they stand on the issues. See the list, read their blogs and connect via the voter forum – all live at oct.ca as of January 10th.